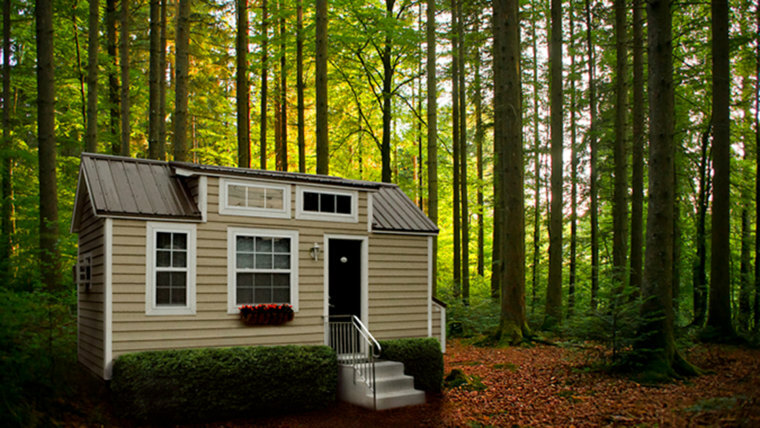 Seniors are finding freedom in the tiny-house lifestyle. Adele Smith knew she needed to make a change. Back in 2016, the retired music teacher was living alone in Nashville. Her daughter had long since moved out, and Smith felt like she was rattling around in her 1,300-square-foot townhouse. So Smith, 61, made a drastic move. After doing a lot of research, she decided to downsize to a tiny home. She got rid of her townhouse and moved into a 140-square-foot bungalow outside Portland, Oregon, where she's closer to family. Her new home may be just a tenth the size of her old one, but Smith says she is “snug as a bug in a rug” in her teeny digs. She has everything she needs: a cozy kitchen and living area, a full bathroom and a lofted bedroom. She even has a covered porch with a hot tub. Tiny houses, which often measure less than 400 square feet, can be an attractive option for retirees who want to downsize after the kids leave the nest. For one thing, they can come with major financial advantages. Smith paid $65,000 for her tiny house, an incredible bargain compared to Portland’s median home sale price of $394,100. Smith’s house is light and airy, with a beautiful natural wood interior. People often buy tiny houses upfront, meaning there are no monthly home payments. That was a huge draw for Dani Moore, who paid $22,000, plus renovations, for her own 206-square-foot house in Hesperia, California, in 2016. “I really, really wanted to live somewhere where I was mortgage-free,” Moore, 62, told TODAY Home. Moore, who runs the blog The Tiny House that Grandma Built, also liked the idea of owning fewer things and downsizing her life — not just for her own sake, but also to make things easier on her adult daughter down the line. Moore remembers the stress of moving her own mother into assisted living and having just two weeks to sort through her mom’s many possessions. Smith was also attracted to the simplicity of the tiny-house lifestyle. She has a “minimal amount of clothes,” and she also enjoys leaving a smaller carbon footprint. She installed a composting toilet to minimize water usage, and she uses the compost to fertilize her garden. “I’m getting back to nature,” she said. Living small can be a great idea for seniors, but it can also present major challenges. Moore, for example, has severe osteoporosis and uses a mobility scooter, so she's had to find creative ways to make her home accessible. She installed a custom wheelchair ramp, and she uses a three-wheeled stool to slide around inside the house. She even installed a chain hoist with a rock climbing harness so she could raise herself up and down to her two lofts. After a while, though, she developed bursitis in her hips, which her doctor thought might have come from using the harness. As more seniors take an interest in tiny house living, there's a growing opportunity for companies to cater to older buyers. Tiny Home Builders, a company that constructs and sells plans for tiny houses, designed a micro home especially with older customers in mind. The Atlanta-based company’s "Tiny Retirement" home model is single level, so the owner doesn’t have to climb stairs or a ladder to reach a lofted bed. Dan Louche, who founded Tiny Home Builders in 2009, originally designed the "Tiny Retirement" house for his mom, Kathy, after her mobile home in Florida suffered severe hurricane damage. When Louche saw how much his mother loved living in her tiny house, he decided to scale the idea and sell the building plans to others. So far, he has sold about 120 sets of plans for the "Tiny Retirement" home, and counting. Louche says there's a growing interest overall in the tiny-house lifestyle, and senior citizens are no exception. Tiny house living isn’t always a permanent solution for all seniors, however. After about seven years in her tiny home, Louche’s mom developed health issues that made tiny living unworkable. She moved to Georgia to be closer to family and no longer lives in a tiny house. For now, though, Moore is still thriving in her accessible home, and she hopes to stay as long as possible. Likewise, Smith has no plans to move anytime soon, and says she expects to live in her home for 20 years, "assuming good health." While she knows that tiny living isn’t for everyone, Smith couldn’t be happier in her cozy house. 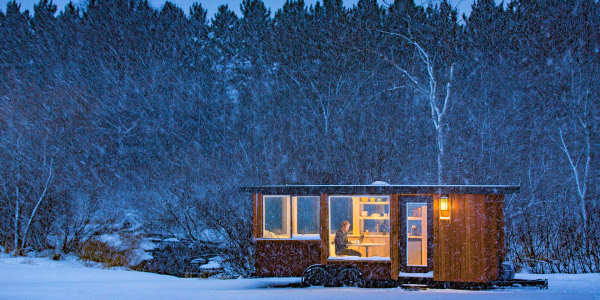 In fact, she often forgets that her 140-square-foot dwelling is considered a novelty.